Available SEPTEMBER 22nd 2009 . . .
FREE Limited Edition 2-Hour Bonus DVD available only to customers who pre-order Loose Change 9/11: An American Coup between July 15th and September 21, 2009! Microcinema International DVD is proud to be the exclusive distributor of the riveting new documentary in the famous Loose Change series: Loose Change 9/11: An American Coup. This film will have its official release on Tuesday, September 22nd, 2009, but those who pre-order it between NOW and September 21, 2009, for only $17.99 (Europe 17.99€ / £ 12.99) (plus shipping and handling) will receive a FREE Limited Edition 2-hour Bonus DVD that will ONLY be available to pre-order customers via www.loosechange911.com or www.microcinemadvd.com, and will not be sold in stores! Note: your credit card will be charged for this purchase but it will not be shipped to you until September 22, 2009, the official release date for the film. With the departure of the Bush Administration and the arrival of an "era of transparency," opportunities are arising for the disclosure of new information that may shed more light on the events that took place before and after 9/11/2001. Dramatically narrated by Daniel Sunjata of FX's Rescue Me, and an outspoken advocate for the First Responders, Loose Change 9/11: An American Coup first examines mysterious and infamous events that reshaped world history - from the Reichstag Fire in 1933 that catapulted Hitler to dictatorship - to the Gulf of Tonkin Incident in 1964 that led to the Vietnam War, and then takes viewers on a turbulent journey through several pivotal moments in history before delving into the most significant catastrophe in recent memory, 9/11. Loaded with powerful, new footage and in-depth interviews with the likes of Steven Earl Jones, an American physicist who has discovered undetonated explosive material in multiple samples of dust from the World Trade Center collapses, this documentary presents a wide array of evidence both known and unknown... until now. Eight years later, the American people continue to live in the aftermath of 9/11 and deal with its ongoing repercussions. Is this just another machination of power on the timeline of history? If so, the real question is what happens next? Or better yet, what can we do to prevent another 9/11? The film serves as a fundamental call to action which is fueled by hope that those affected by 9/11 will soon receive the answers that they have sought after for nearly a decade. 12 page booklet featuring Daniel Sunjata's manifesto entitled "Intellectual Dishonesty in the Age of Universal Deceit: A Message to the Corporate Media and Our Elected Officials"
An exclusive, never-before-seen look at the original script from 2002 that started it all, and footage from the 2004 scenes that were shot in Upstate New York. A documentary covering the long, twisted history of the Loose Change series, including how it all started, what happened along the way, and what the filmmakers hope to accomplish in the future. It also includes the making of and behind-the-scenes of Loose Change 9/11: An American Coup. The Script of Loose Change 9/11: An American Coup. A selection of images from the numerous activities and screenings that the Loose Change crew have attended or organized over the years. An intimate look at the massive amount of interviews conducted over the years by the Loose Change crew with activists, researchers, eyewitnesses, etc. Includes Barry Lichty, the Mayor of Indian Lake; Barrie Zwicker, a Canadian journalist; KRS-One, a hip-hop legend and pioneer, and others. © Microcinema DVD. Microcinema International. All Rights Reserved. For off-line ordering information, exhibition, licensing, and other distribution channel inquiries please write infomicrocinema.com or at the telephone number above. For high-resolution product and programming images contact at email and number above. I can't wait to see it. Are there any trailers on the web other than the one shown on the new Loose Change web site? I would love to see more. 9-11 Joe on Thu, 07/16/2009 - 4:21pm. Lullaby Academy on Thu, 07/16/2009 - 4:34pm. This looks like a film that will open some eyes and hopefully wake millions more to what is going on. It's good to see that the production value has increased and that Dylan and Jason can realize their vision now. Dave Nehring on Thu, 07/16/2009 - 5:08pm. Judging from the trailer - looks great. Best wishes and Respect to all involved. Binkster on Thu, 07/16/2009 - 5:17pm. I'm looking forward to watching it. Flicker on Thu, 07/16/2009 - 6:09pm. Pre ordered mine already yesterday. Just wish the shipping cost wasn't so high. Phaedrus on Thu, 07/16/2009 - 6:27pm. you get a two hour bonus disc! Joe on Thu, 07/16/2009 - 6:41pm. Phaedrus on Thu, 07/16/2009 - 8:11pm. Dylan let a few of us here in SD see the intro, it was amazing. This is done very professionally. I can't wait for it to come out. sewalkie on Thu, 07/16/2009 - 7:39pm. The coup on America happened decades before. Some would say in Dallas with the assassination of Kennedy did the coup overtly happen. 9-11 was just a REAFFIRMATION of that original coup. It was just a next step to accelerate the process of building their so-called New World Order. Most, if not all, of the original surviving players in the 1963 coup were still in important positions of power, or at a minimum, in positions to wield influence and protect their positions. Every successive administration since 1963 has participated in the coverup of the assassination, every single session of Congress has participated in the cover-up. There has been NO LEGITIMATE federal government since 1963, despite the sham of 4-year and 2-year elections. If a gang of criminals and assassins took over the government in 1963, as can be argued, then the perpetuation of those successive governments by the criminals and their following accomplices, it is still illegal to this day. Are a gang of criminals going to impeach themselves? Are a gang of criminals just going to walk away? Are a gang of criminals going to let real investigations take place on any matter of national importance? rebel patriot on Fri, 07/17/2009 - 9:28am. We must do the investigation ourselves, and publicize our findings ourselves. A truly objective, impartial investigation is not possible given the circumstances as pointed out by rebel patriot. Sheila Casey on Fri, 07/17/2009 - 4:07pm. This is very complex and we don't really know exactly when it happened. I agree probably before 911. Robert Bowman mentioned JFK being the date in his recent Alex Jones interview. This is an excellent interview. Ellen brown's Web of Debt points to an earlier time. Either way, I like the title. Many don't even know what a coup is, just like false flag operation. sewalkie on Fri, 07/17/2009 - 5:31pm. There are multiple ways to look at this. One is to look at it from a regime change point of view. You could say that a coup d'etat is committed every time a ruler seizes control through election fraud, assassination, or army intervention. To put it another way: one faction eliminates the other by force or fraud, unconstitutionally and with no mandate from the people. JFK's murder definitely fits that description. The network behind that could be very complex, but I'm not of the Tarpley or Alex Jones school that thinks that presidents and vice-presidents are just puppets. This depends. Obama is definitely a puppet, and so were LBJ, Ford and Reagan. Eisenhower, Nixon, Clinton, JFK, Bush sr. and jr. were definitely not. In my view, any unpunished infringement on the constitution is a coup. It's more apposite to say that the "process of transformation was likely to be a long one" (PNAC) , and we have a situation where our liberties are taken away in a sawtooth-like manner, with peaks of infringements and encroachments around crises and catastrophes. Some of these crises are manufactured, (anthrax) others are opportunistically seized upon (Katrina), or a combination of both (9/11, financial crisis). Lately, these violations are increasing exponentially. We should be extremely worried. I would go a step further and say that we've never really had any form of true freedom. All we have is a layer cake of obfuscation of who or what is really pulling the strings. The short answer, for the past 50 years, in my opinion, is George Bush senior and his partners. Bush sr. has been involved in almost every single one of these covert operations, opportunistic crimes and cover ups. He's basically a front man for a whole gang of insane ruthless nationalist, elitist, fascist and imperialist oligarchs. Add to that a cross-section of intelligence, military, religious, royal and financial/industrial elites, each with their own zone of influence. For example, it's pretty obvious that e.g. Eastern elites don't jive that well with Western elites, although they might share a love and understanding of popular repression and persecution. Sort of like Nixon and Mao's little conversation. The real enemy is an idea, not a person or a group. It's about raw power. Power for the sake of power, sometimes backed by a perverse ideology. Power to prevent others from being powerful instead. Money and weapons are only means to an end: ruling a country, a continent, and preferably in the end, the entire planet. I'm convinced that some of these people even think they are acting in our best interest, especially the bellicose nationalists. Specifically, however, 9/11 2001 started with the unprecedented fraudulent 2000 elections, indicative of the urgency felt by the hawks in the shadows. In a system of social interaction, those that rule are those that seek rulership. Such people are often to be found in political, financial, military and intelligence circles. Those last two are particularly powerful because they can covertly manipulate everything (including their own financiers) with near unlimited financial means. For example, the CIA has been known to infiltrate the White House. Are these people going to allow an investigation? I think the National Security Act of 1947 put an end to all such hopes, and the hopes of the those in America's zone of influence, such as my country. Usually we end up with a professional cover up or a limited hangout. The truth is not in such investigations or memoirs of key players. Real truth can be uncovered through scientific scrutiny, and will at times make your head spin. We shouldn't give up, but I do feel like that scene from the Matrix, where the 'Architect' says that so called 'revolution' and subsequent destruction of the revolutionaries are merely another system of control. You'd be best off as a hermit. SnowCrash on Sat, 07/18/2009 - 6:02am. "Obama is definitely a puppet, and so were LBJ, Ford and Reagan. Eisenhower, Nixon, Clinton, JFK, Bush sr. and jr. were definitely not." Where do you get this information? What is the criteria? "We shouldn't give up, but I do feel like that scene from the Matrix, where the 'Architect' says that so called 'revolution' and subsequent destruction of the revolutionaries are merely another system of control. You'd be best off as a hermit." This doesn't sound like your usually strong perspective. Orangutan. on Sat, 07/18/2009 - 10:07am. Reading Obama's book, reading Fletcher Prouty..as for Reagan, I'm convinced that Bush sr. had something to do with the assassination attempt. Afterwards, Reagan was never the same, and complied. LBJ...well...some say he was involved with JFK's murder. On the other hand, he escalated the war in Vietnam shortly after JFK's assassination, giving the MIC exactly what they wanted. Many documentaries and books describe this as capitulation. Eisenhower warned of the military industrial complex, experienced as he was, dealing with the military. To me this is an act of defiant heroism. Clinton? Just my personal assessment of his character. Capable of as much evil as his predecessor and successor, just a different style. He's now even buddies with Bush Sr. Covered up WTC '93 and orchestrated and/or covered up Oklahoma '95. Orchestrated the PR spin on the war in Yugoslavia. Collaborated with Al Qaeda in secret. Bush Sr. ... this should go without saying. Jr? Grossly underestimated. Have you seen his behavior off record? JFK did numerous things that infuriated Allen Dulles & the CIA, the Mafia, the Cubans, McNamara & DoD, his chiefs of staff, bankers, and generally sailed his own course. He paid with his life. Ford ... well... he was a Warren Commission stooge who confessed of a cover up on his death bed. A pathetic man. As for the defeatist closing statement, including the 'hermit' reference...I have my days where I simply feel powerless and cynical. I apologize if that's demoralizing. I've been a fervent supporter of civil rights and privacy since ten years now...and all I've seen happening is further encroachments and infringements. Dutch (and generally Western European) people are the absolute pinnacle of apathy. In a few months it will be mandatory to provide your fingerprints in exchange for a new passport. These prints will be stored in a centralized government database. I can picture them now, my fellow sheep faced citizens, celebrating their increased protection from identity theft. I guess this is what pushed me to contemplate life as a hermit for a moment. NYCCAN and the 9/11 truth movement are something to hold on to. And perhaps emigration to Latin America. SnowCrash on Sat, 07/18/2009 - 11:23am. was most likely perpetrated by G.H. W. Bush to remove Nixon, so it was a coup, as well. Nixon was clearly not part of the eastern or oil elites, not trusted by them and he was extremely paranoid about them. I think his paranoia became pathological after he was made aware of the operation to take out JFK. It was only a matter of time before he cracked under the strain. I would submit that every president since JFK was a puppet, some more conscious of their role than others. LBJ was a very willing soldier for the eastern and oil elites. I think it is not hard to argue that G.W. Bush was groomed to be the "poster boy for incompetence" for an operation like 9/11 (which then became the 9/11 operation). In my opinion, G.H.W. Bush should more appropriately be labeled as upper middle management, one of the many people willing to do the dirty work for the elites in order to insure his place (and his families place) in their world, just as his father did (along with a fair number of the Walker clan). Mr. Cheney also falls into this category, as does Mr. Baker, Mr. Rumsfeld and a few others. If you have not read it, I recommend Family of Secrets by Russ Baker. While Mr. Baker has a rather strange opinion of Bush's role in the October surprise and completely ignores some other things, his investigation into Bush's role into Watergate is credible and valuable, imo. Mr. Clinton was bought during his time as governor and the purchase of Mrs. Clinton was completed when she moved into the White House. Not too many people can resist the threat of total destruction when compliance buys you a place in the room with the elites, and the Clintons and Obamas are no exception. Mr. Carter was a bit of a wild card, but he was easily reigned in by the Machiavellian Dr. Brezinski and a few others within the financial elites and the MIC. I think he's been trying to atone for his role in pushing along the Anglo-American empire project ever since, while trying not to get himself or his family killed. Only by exposing the extreme levels of institutional corruption in the U.S. can we have any chance of derailing this pathological system that we now find ourselves in. 9/11 truth has the power to do this like no other issue. Love is a verb, brothers and sisters, so let's get busier! LeftWright on Sat, 07/18/2009 - 12:37pm. I place George HW Bush a bit higher up the chain than you, I see his career from soldier to intelligence to president as a transition from errand boy to underboss to mafia kingpin. "According to Nixon's biography, his personal and political ties with the Bush family go back to 1946, when Nixon claims he read an ad placed in an L.A. newspaper by the Orange County Republican Party and a wealthy group of businessmen led by Prescott Bush, the father of George Bush. "They wanted a young candidate to run for Congress. Nixon applied and won the job, becoming a mouthpiece for the Bush group, progressing to the U.S. Senate and in 1952 the vice presidency. "In 1960, Vice President Nixon was scouring the world seeking the presidency. 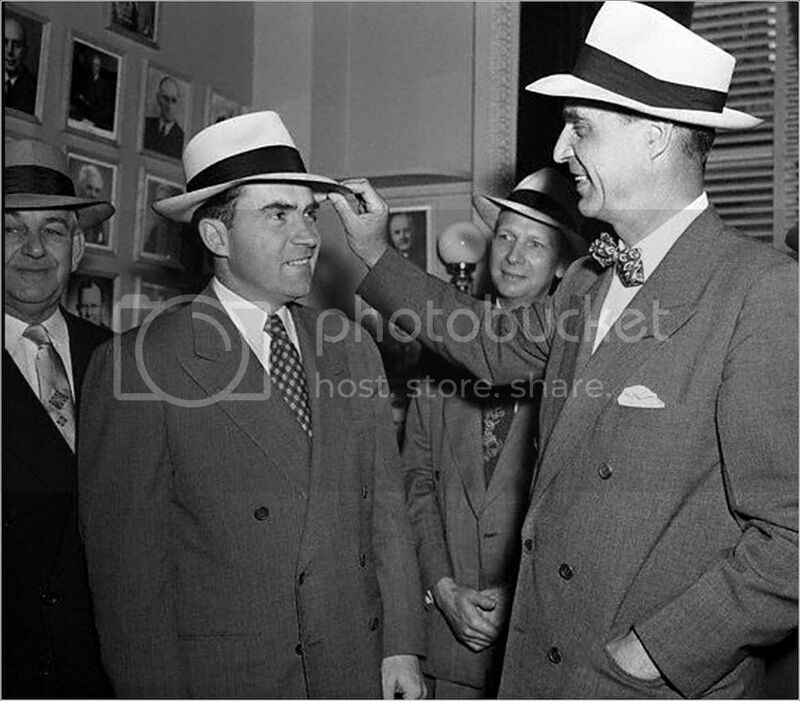 At his side was Prescott Bush. Congressman Gerald Ford was helping raise funds, as was George Bush. "It took Nixon eight more years to reach his goal. And the canny politician always remembered who helped him get there. So again it was payback time for George Bush. Nixon appointed him Chairman of the Republican National Committee, and later ambassador to China. "By 1976, Ford, who succeeded Nixon after Watergate, paid his due bill. He picked out big job for his old crony, Bush: the CIA. But this time Bush would not be an underling. Now he would be head man." SnowCrash on Sat, 07/18/2009 - 1:08pm. or accept public appointments, they prefer to stay behind the curtain and let others mingle with the common people. Yes, Nixon was tapped and brought into the fold by exposing him to the JFK operation, but was never fully trusted, became a liability and was set-up for removal. LeftWright on Sat, 07/18/2009 - 1:45pm. Yes, about those elites: I'd like to really understand the lines of communication after one of their groomed candidates takes office. What I miss in analyses by historians and researchers is how the sock puppeting actually practically works. Often the Bilderberg group, the CFR and the Trilateral Commission are then brought up, but I feel the executive power ascribed to these groups maybe be somewhat inflated. The Nixon tapes suggest not much more than a simple top down hierarchy (king/advisers). The vagueness of this system tends to be a bit frustrating. I need to learn much, much more. Well..right now my plans are pretty vague, but countries like Argentina, Bolivia, Venezuela, Uruguay and Chile appeal to me. I'd most likely tune it to the political situation and stability. It's easy though, because almost the entire continent speaks one language. Suriname would also be an option, because of the links to NL. SnowCrash on Sat, 07/18/2009 - 5:52pm. 9-11 Joe on Fri, 07/17/2009 - 10:54am. I trust Dylan and crew to bring the goods. simuvac on Fri, 07/17/2009 - 12:49pm. September 22 ? ? ? I'll buy one, but only if they release it on Sept. 11. Chris Sarns on Sat, 07/18/2009 - 1:48am. and I look forward to asking Dylan Avery about it when he comes up to SF in early September for our annual film festival. I should order a copy, as I want the extras. I hope you buy good beer. LeftWright on Sat, 07/18/2009 - 1:48pm. 9/22 is fine w/ me. truthoverprofit on Mon, 07/20/2009 - 7:05am. I buy a copy of everything Dylan produces, just to have a copy and contribute to the cause. He busted it wide open and deserves our support in whatever he does. It's all good [if not perfect] and well worth watching. Chris Sarns on Tue, 07/21/2009 - 2:32am. this on the big screen? The guy has been screwed by our Gov. maybe he's in the mind set to fight to the finish? Joe on Mon, 07/20/2009 - 1:03pm.